I’m sure we’ve all been subjected to the talk of the “power of positive thinking.” I’ve never read the book with the same title by Norman Vincent Peale, but I know enough to know his theology wasn’t very sound nor biblically based. 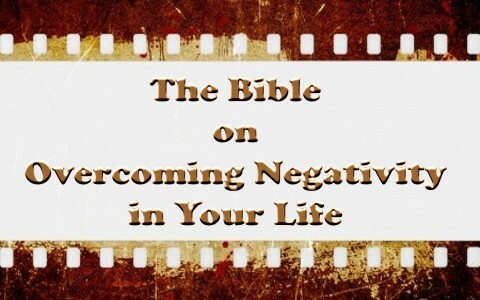 So without making this a treaty on the book or Peale’s principles, let’s look at what the Bible says about overcoming negative thoughts and see how some of the Bible’s principles of positive thinking can change your outlook on life. One simple way to overcome negativity is to become more thankful. When you are emotionally down it may be hard to feel thankful. But if you will look at thankfulness as a command and try to be thankful because God tells you to be thankful, it may make it easier to pull out of the mood you are in. The Bible says that David encouraged himself in the Lord (1 Samuel 30:6). Lest you think that David had so many wonderful things going on in his life, realize this verse also says that at the time David’s military men were rising up in mutiny to stone him. David had led the army to war. While they were away from home their city was burned to the ground and all their women and children were taken prisoners. Things were not going well in David’s life. David put on a positive attitude and looked to the one source of help he knew he could trust—God. In the next few verses David prayed and looked to God for direction. Then he obeyed what the Lord had said. Undoubtedly you’ve heard the illustration of the two shoe salesmen who went to a primitive tribe where no one wore shoes. One salesman looked at the situation in disgust and wrote back to the home office that he would never be able to do well among the primitive tribe because no one wore shoes. The other salesman wrote back excited with all the possibility because no one there had any shoes yet. One of my favorite verses I like to use when teaching people a new skill is Proverbs 16:3 which says that we should commit our actions to the Lord and then our thinking will follow. I remember when I first started running for exercise I engaged in online conversations about how many miles a week a person had to run before he could call himself a runner. A few weeks later it seemed like a silly question. If you run, you are a runner. It took some time for my mind to accept that doing the activity made me a participant of that activity. The same can be true with trying to have a more positive outlook on life. If you will act in a positive way, you will begin to have a more positive attitude. However, if you spiral into negative thinking and negative actions, then you can only expect that negative thinking will continue. Not being a victim goes hand in hand with everything mentioned before. If you will be thankful, encourage yourself and do what is right, then you can overcome the thoughts of being a victim. Let’s take a brief look at two men in the Bible, father and son, name Jacob and Joseph, you will see two very different attitudes. Jacob considered himself a victim. Joseph did not. Jacob said at the end of his long life (147 years), that his years were “few and evil” (Genesis 47:9). If you know the story, you know that Jacob was to blame for just about everything that happened to him. His own wrong choices put him in every bad situation he was in. He was a victim to his own stupidity, and he lived like a victim. On the other hand, his son Joseph, when he was about only about 40 years old and had suffered many injustices said that everything was great. He said God was good and God had a plan (Genesis 45:5-8). Joseph had even more reason to be negative than Jacob. Everything bad that happened in his life—and there was a whole lot of it—was caused by others. He really was a victim, but never allowed that to control his thinking. Interestingly, many of Joseph’s problems started because of Jacob’s bad choices. Joseph suffered because of Jacob’s attitude of being a victim. Another of Joseph’s strengths was his ability to look at everything that happened to him in light of God’s eternal plan. Joseph said to his brothers when they were begging his forgiveness that even though they had intended evil to him, God meant everything that happened for His purposes (Genesis 50:20). The family of Abraham, Isaac and Jacob was preserved by Joseph being sold into slavery and becoming the prime minister of Egypt. Joseph saw the bigger picture of what God was doing. He did not allow the hardships stop him from trusting God. Joseph kept a positive attitude. Even though people were against him, God never forgot Joseph. God was able to work through Joseph because Joseph did not insist on taking control of every situation and manipulating it to his benefit. When you are faced with negative things going on in your life try to see what God may be doing through that. You may never know this side of eternity what everything that happens to you means in your life, but have enough faith in God to trust His plan. Positive or negative thinking. Which will you choose? My medical doctor was speaking to a group of pastors and missionaries when he reminded us that our world and our bodies were cursed by the fall of man. The curse of sin can cause imbalances in a person’s body that may cause an honest medical condition of negativity and depression. In these cases medication can be a tremendous help. However, there are also many cases where a person’s lifestyle and actions cause unneeded negativity. Doctors and medication may be a help in your situation, but less invasive forms of treatment like changing your thinking and lifestyle may offer greater results and true healing from a negative condition in your life. This is an interesting article. It has some good thoughts. However, I find the writer to exhibit thoughts that are negative, even while trying to write an article on being positive. Specifically, He states that he has never read Dr. Peele’s book “The Power of Positive Thinking, yet the writer states that the book is not biblical sound since , if I understand his writing correctly, id because he does not find Dr. Peale as a doctrinally sound individual. Such general statement by the writer cannot be accepted as factual as it is not backed up authority. Moreover, the question begs: “How can one say a writing is not biblical sound when you have never read the writing?” Based on the foregoing, I challenge the writer to read Dr. Peale’s book with an open mind. The writer of this article needs to re-examine his thinking.